The new series of WPS automatic wrap-around case packers enriches our packaging solutions. The WPS series has been in fact designed to pack a large variety of products and to meet the highest production standards and quality regulations. In line infeed conveyor with adjustable speed controlled by inverter. Cardboards pick-up by means of an oscillating arm with suction cups driven by a gearmotor and controlled by inverter. Cardboard positioning on the polizene guides, without contact with the transmission chains. Load of the product into the open U-shaped carton with double 2 cartesian axis motorized pusher controlled by 4 servomotors. 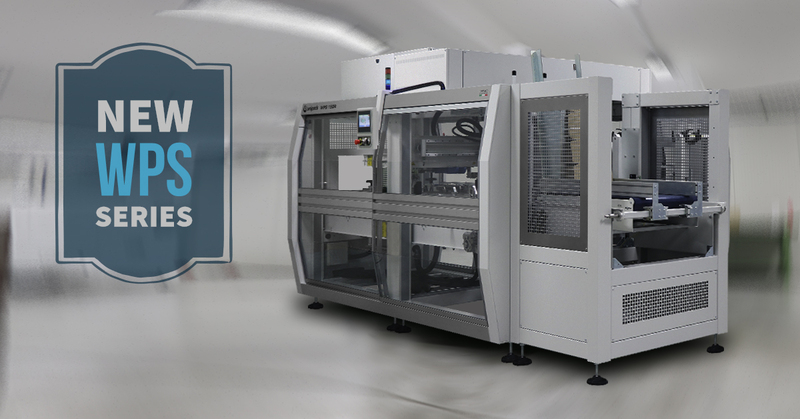 Motorized transversal hot melt glue applicator, controlled by inverter and encoder. Closure of the internal side flaps, external flaps and squaring of the finished case by pneumatic actuators. Its compact design, that respects the basic lines of all our products, decreases the need of big spaces to operate, and thanks to its highly technological components, it is possible to obtain high productions in reduced times, up to 25 packs/minute. To know how it works, we invite you to watch the following video by clicking on the link.